I am so worn out guys. 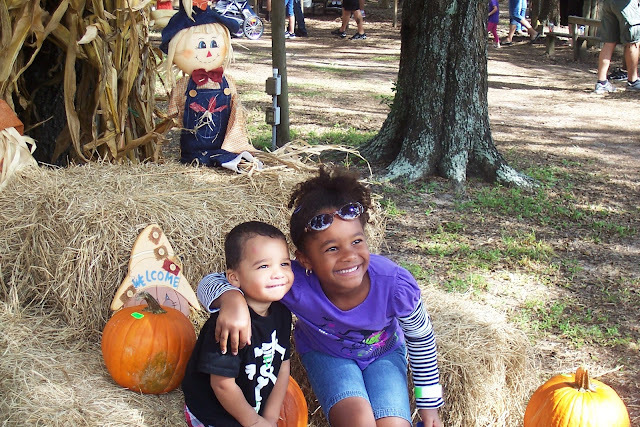 I spent most of the day at a pumpkin patch with my grandchildren, daughter and niece. We went on a hay ride, Alivia and my niece did the zip line, plus they rode horses. Little Mason sat on my niece's lap and really enjoyed it. There were a couple kiddie rides and a maze. We bought pumpkins and kettle corn. When my daughter was growing up I was the fun mom. But I sure aint the fun grandma. The degenerative disc disease in my back has really slowed me down. I can barely move right now but seeing the smiles on Alivia and Mason's faces was worth it.